✔️ 2 Adorable Animal Designs: Choose from a blue Shark or pink Minnow with matching goggle. 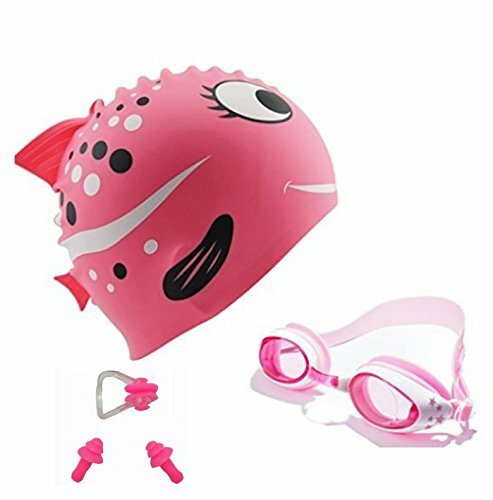 Kids go crazy for these unique, colorful swimming hats and goggles! ✔️ Safety First: Our eye-catching cap designs double as a safety feature! Now you can more easily spot your little swimmer while they\'re playing in a crowded pool or ocean. ✔️ No More Foggy Vision: Features premium lenses with an interior and exterior anti-fog coating that also filters out sunlight. Kids 3-12 can swim with more confidence! ✔️ Soft & Comfortable to Wear: The swim cap is made of premium silicone material which is ultra-stretchy and soft, so it feels comfy and doesn\'t snag hairs. The goggle offers a secure and comfortable fit in combination with adjustable straps and nosepieces. ✔️ Protective Lenses: High-quality lenses are shatterproof & offer 100% UV protection when outdoors. Plus, our goggles\' secure fit keeps water completely OUT of your child\'s eyes.